but when noon on Sunday rolled around, I faced the fact that I wasn't going to have a chunk of free time again for another week or so and got to work quilting. I tackled the middle part first, because I anticipated it being the hardest, and yes. It was. It was really difficult. 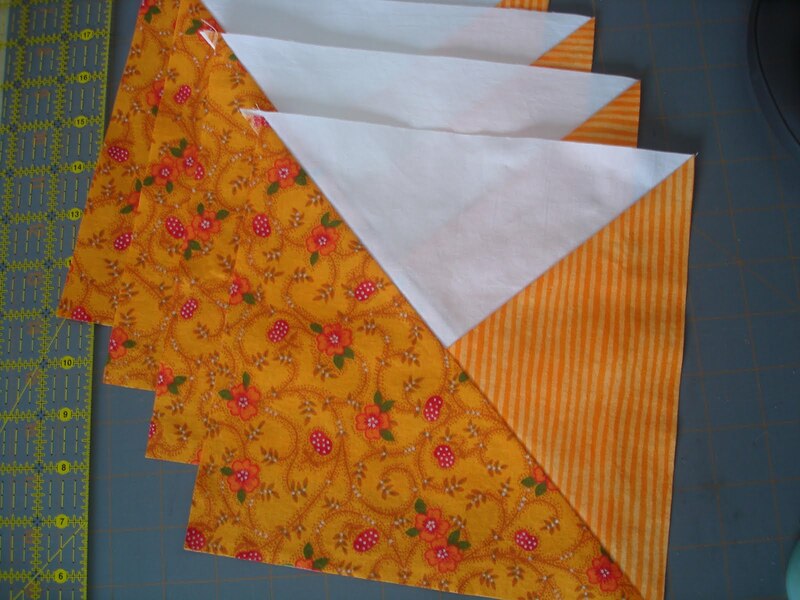 I firmly believe that cinnamon-roll-rolling a quilt causes the layers to shift badly, so I fan-folded the end that went into the throat of the machine instead. Nonetheless, the whole time I was quilting, I felt like I'd have a lot of thread-pulling-out to do once I got to the end and took a look at the whole thing. It was a pleasant surprise that I could easily live with it. The one comment I've gotten most from people (in all areas of my life) is that my handwriting is tiny. One of my highschool teachers blamed me for her having to give in and get bifocals. We think that my small but legible handwriting also won us points in the eyes of our current landlords, who had a zillion applications for this place. Every workplace, every application, every freaking deposit slip I've filled out has involved someone saying "Oh, your handwriting's so tiny!" 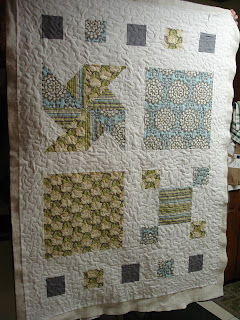 My latest theory is that tiny handwriting corresponds with tiny fmq motifs. And on this quilt, I was writing in 200-point font, or at least trying to. I worried that I'd start at 200-point and by the end I'd be back down to my preferred 10. My first fmq sports stipple curves that are miniscule compared to these. 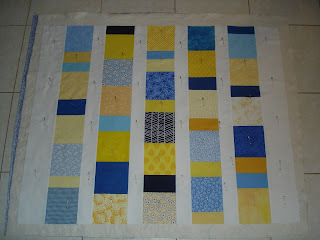 I could've finished that whole 30x30 quilt in 10 minutes if I'd been stitching motifs this size. From what I can tell, though, I didn't regress too badly. Next, I cut the edges and then bind. That probably won't happen until next weekend. 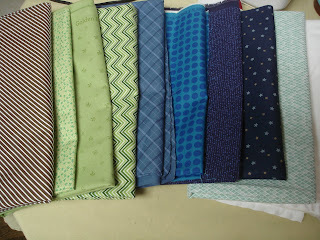 Until then, I'll be fighting off the urge to whip up another quilt top using blues and greens, because that stack of new fabric is sitting there, looking all nice together. These took me seven months. And yielded more support for my hypothesis that it's difficult to get the motivation to work on black socks. 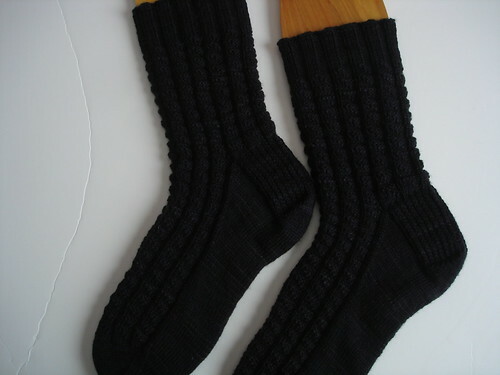 When I gave them to Other this morning, and suggested perhaps that someday he might like some gray socks, he reacted as if I'd suggested he drive the car into the side of the house or eat a tin can sauteed in asbestos. No way. I don't understand why this color isn't more popular. It never stays on the site for more than one round, and I suspect it only ever comes back because I request it. 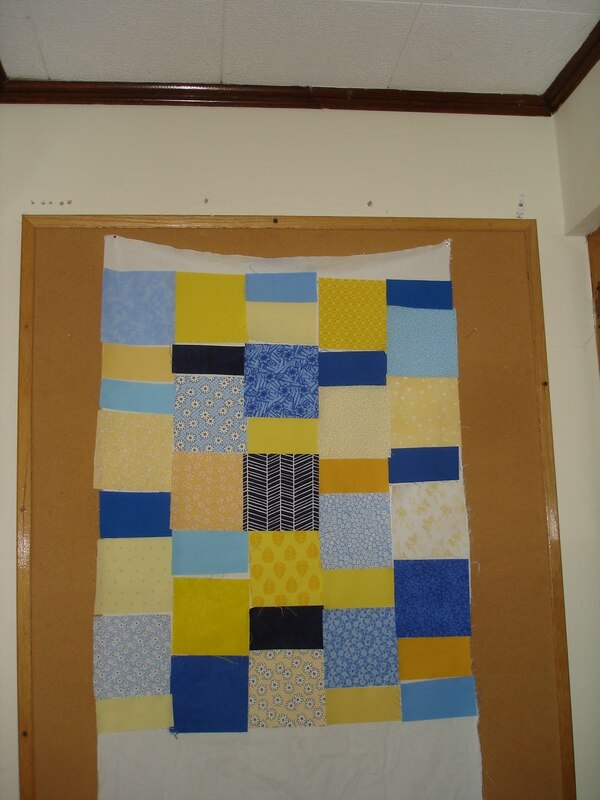 I'm thinking of nicking the basic color scheme for a quilt some day. 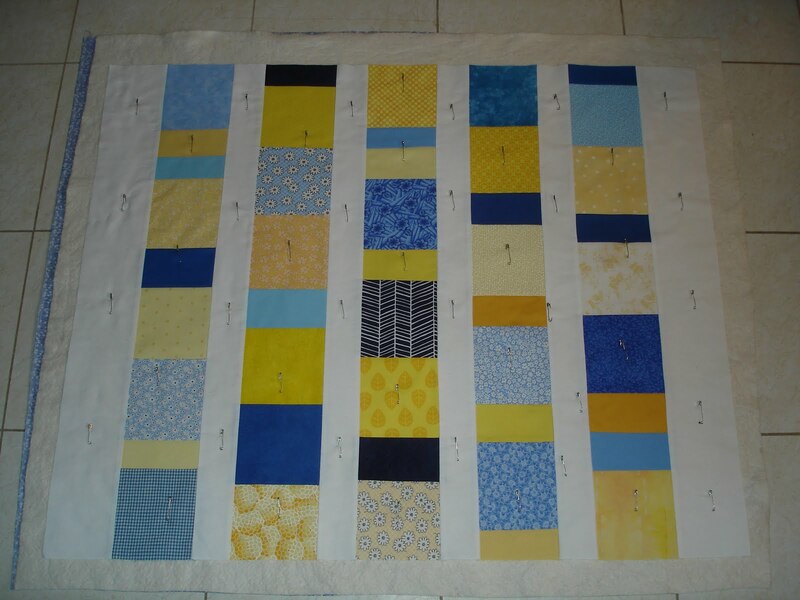 Speaking of quilts, forward progress has resumed after my sewing machine (who shall hereinafter be known as "Sewey") returned from a second trip to the shop. 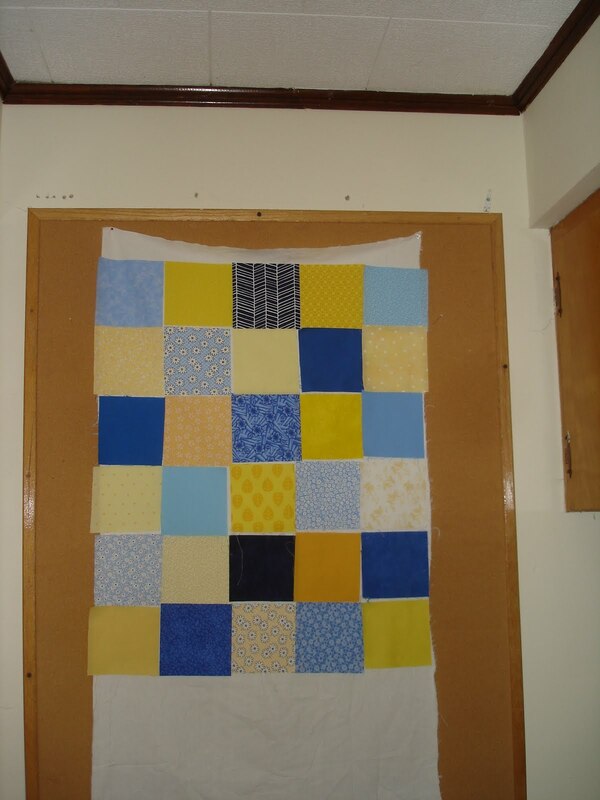 I used its absence to move forward on the Giant Quilt of Giants back, doing the math, establishing a design, and beginning to cut pieces for it. I should really start stippling Cartoon Pinball, but have to admit that I'm a little nervous for my first quilt-for-sale. 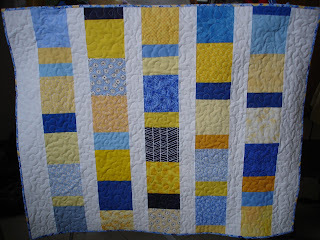 Will probably practice on some swatches before committing to quilting that one. 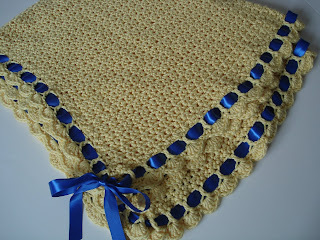 Yay, Tiramisu Blanket is done and in the mail! This is probably the best it will ever look. It's cute and pretty and the colors are striking, and I can't help thinking that after about 10 minutes with an infant, things will go downhill. The ribbon is very slick, and gets pulled around easily, and I should have picked one that was identical on both sides. This is shiny on one side and dull on the other. Perhaps if I make this again, I'll do an i-cord instead of a ribbon, and secure it at several points. The ribbon is 100% polyester, so I ran a lighter over each end for just a second to prevent fraying. This is my first real crochet FO, and I'm surprised at how even the stitches look. My first couple attempts were not going to turn out this way. I hope the new parents like it! It's a little weird, I guess. If things go well today, I'll have it basted and ready to quilt. I finally sucked it up and got back to work on the crochet blanket that I'd been avoiding. 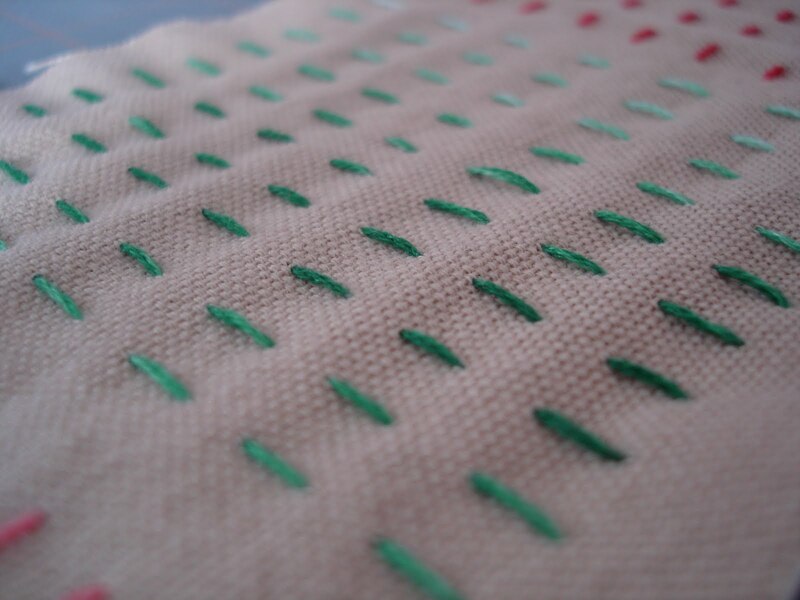 It turns out, if you make no attempt to pick up the same number of stitches on each side, it's really easy and looks fine. 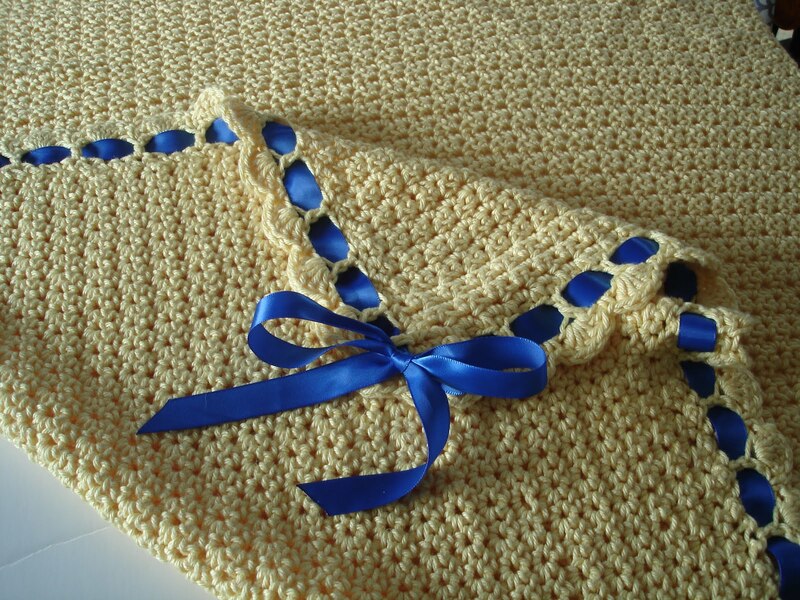 That is the Tiramisu Baby Blanket, mine Raveled here. (That shows an old picture, by the way. I ripped it out and started over after that one was taken. It looks a bit better now.) I love this yarn, Shine, but I can't convince myself that the ends will stay woven in, so I usually go through and secure all of them with thread. Am trying to decide if I should do that, or trust the crochet. Then this will get washed, get a jaunty ribbon (which will probably also be secured with thread because otherwise I'll spend the next 18 years with the niggling thought that the ribbon will come undone and strangle little first-cousin in his sleep, won't somebody think of the children? !, etc. ), and then be mailed off. 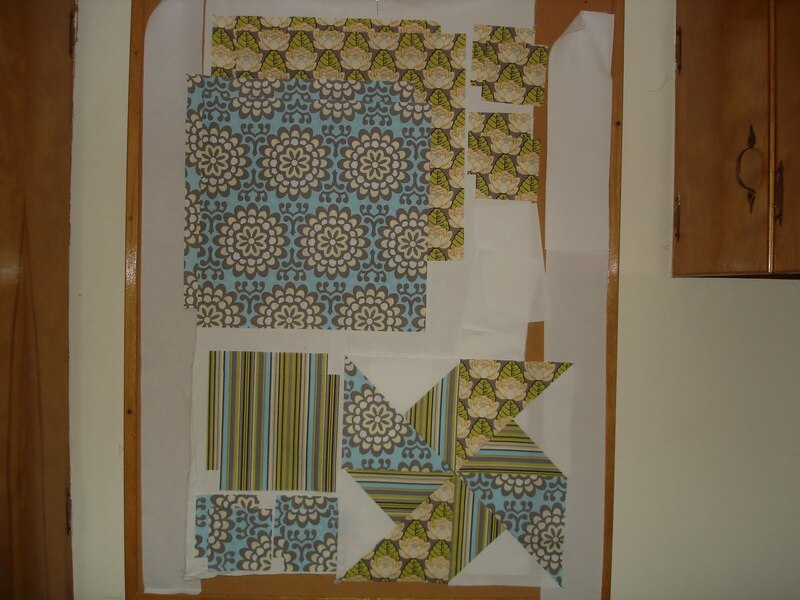 Meanwhile, back at the ranch, I started another quilt I started designing during my captive free time. This one came about because I've had in my stash for years (4? 5, maybe?) several yards of large-scale Amy Butler Lotus prints. I like the fabric a lot, but I don't remember buying it and I don't really know what I was planning to do with it. I was struck one day with the genius idea that large-scale fabric should be showcased in large-scale designs. 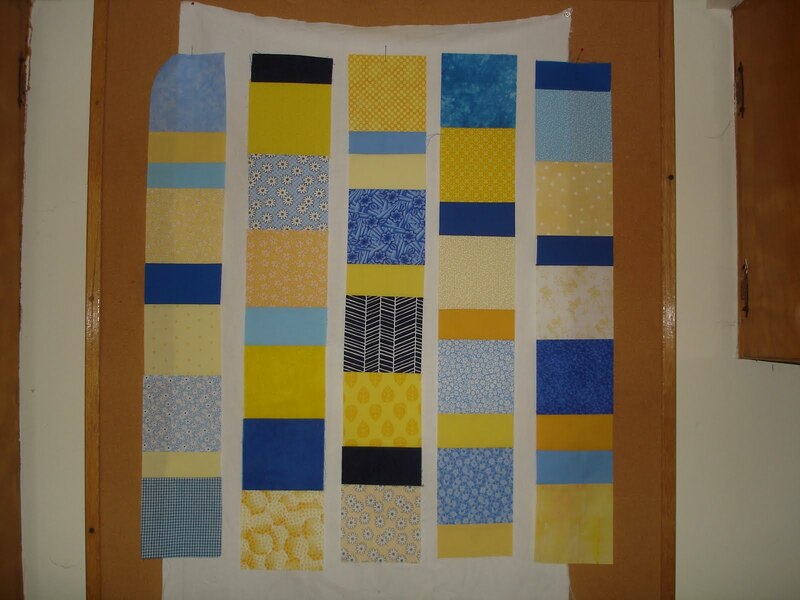 This was after I'd considered using the yardage for quilt backs but decided that I didn't want to relegate them to where they'd rarely be seen. 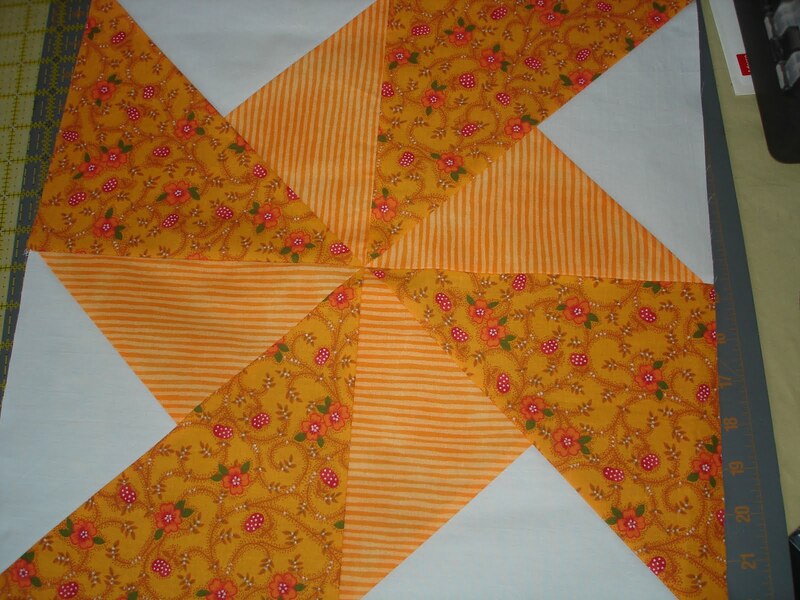 My plan called for combining half-square triangles and quarter-square triangles in a windmill block. 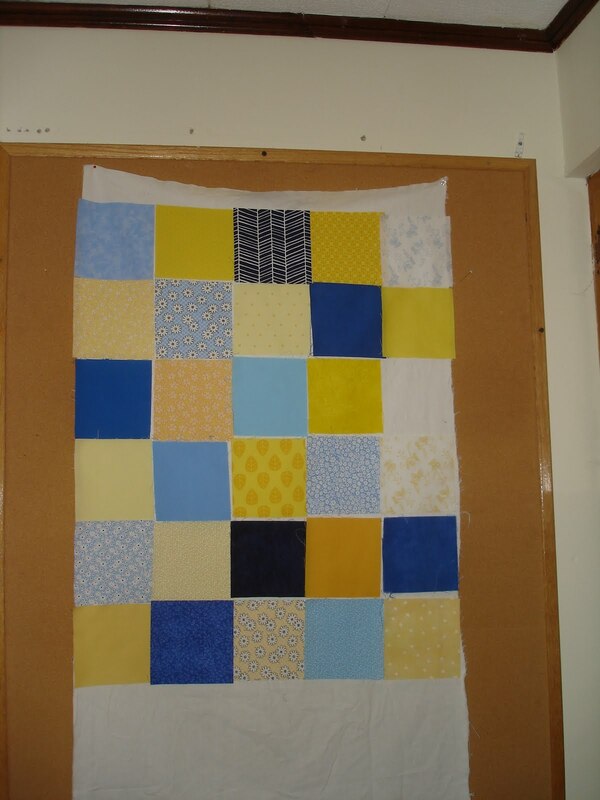 In a quilting class I took, the instructors taught us neat little ways of avoiding working with bias edges. ...But I couldn't remember how to combine different types of triangles. So I did all the math with their handouts, then did a test run with some fabric that was near the bottom of my stash, if you get my drift. Success! 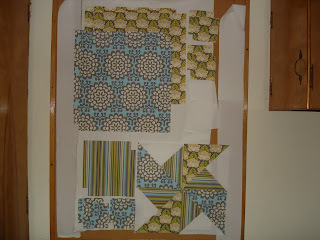 Then I made sure that with my projected measurements, I'd have enough fabric. 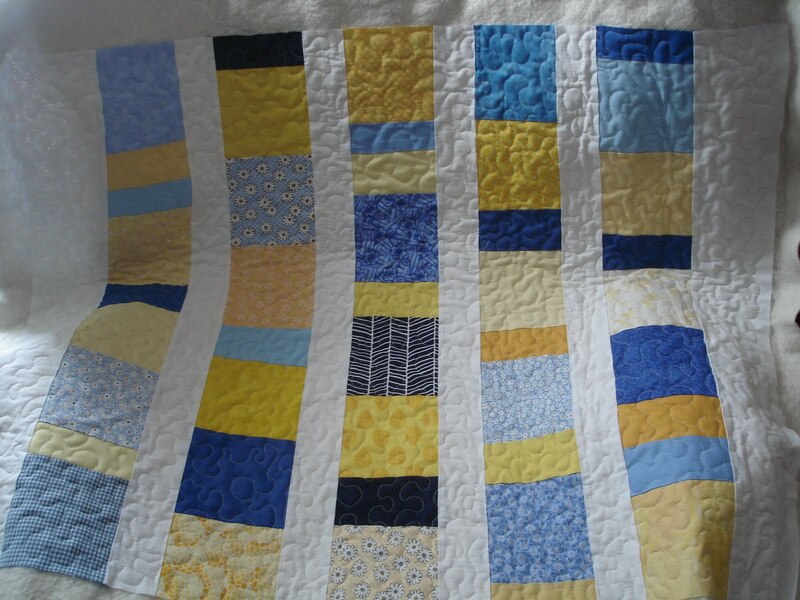 Because I have plenty (or actually, in terms of the stripey fabric, just barely enough), I'll be making two of these and selling one. This is what we've got so far. Perhaps I need a bigger design wall. I'll lose direction and... wash a bunch of fabric. To be fair, though, a bit of the fabric for each of the 3-4 quilts that are next up just arrived today. 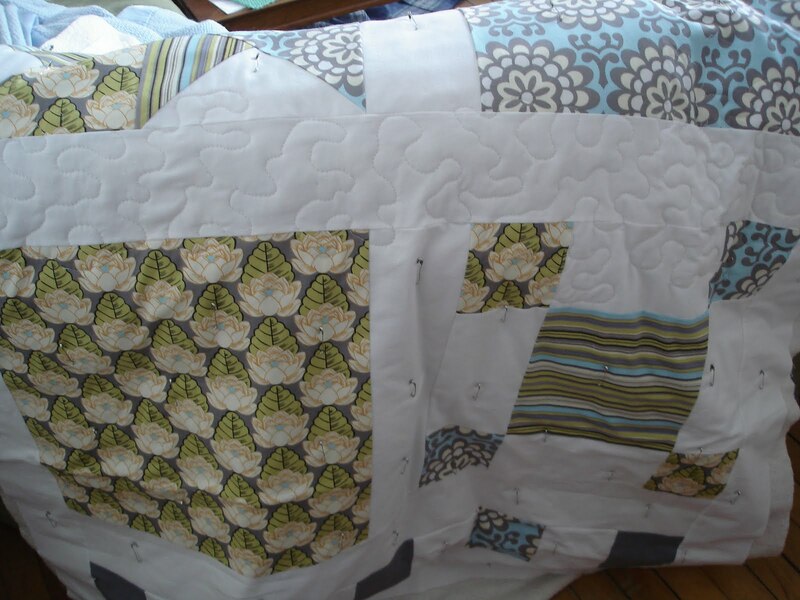 Along with a batting for the mondo gigantic quilt that must weigh 10 pounds. 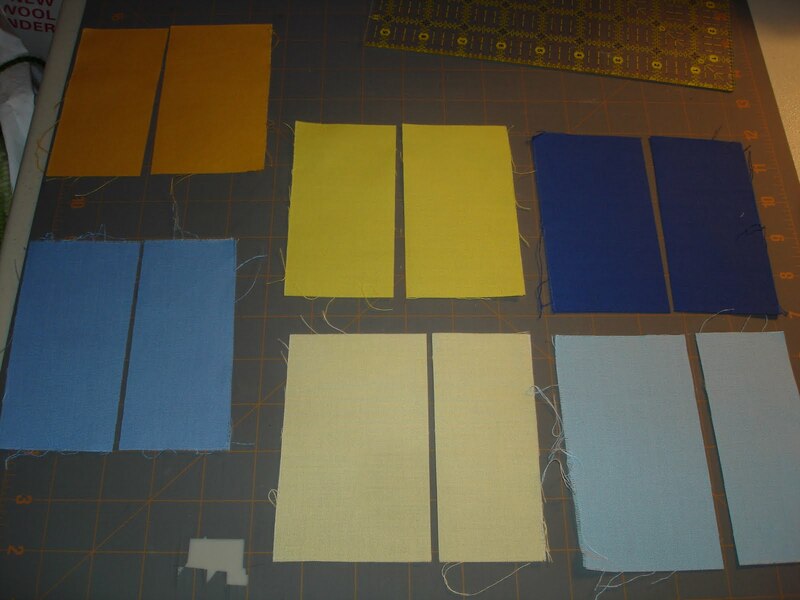 And which is also not recommended for lighter fabrics whoops oh well. If you totally heart anything you see here, you might want to run off to Connecting Threads, because almost all of this is going off soon. They're also having a nice sale on batting. Given this nice little break in project-land, I should probably get back to work on the baby blanket for the baby that's now nearing about 2 weeks old. 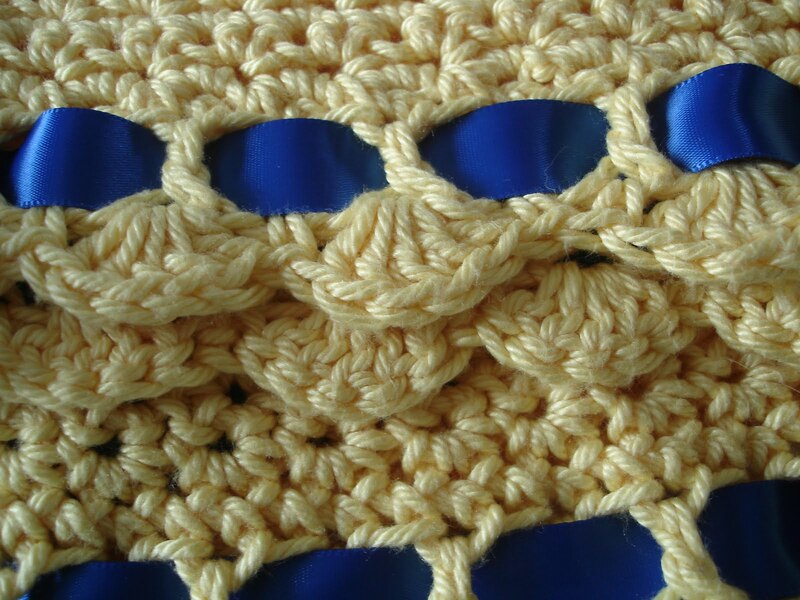 I guess I've been dreading having to develop yet another crochet skill, and also know on some level that picking up (or whatever you call it in crochet) the same number of stitches on each side is going to at least take several tries, if it's not impossible. But the cute border is what makes the whole thing cute, so I better get on it before kid graduates from college. Finish of the week (end!) Sun and Sky is now hanging proudly in my brand new, huge, slightly-less-bare office. It sports both premeditated hanging sleeves (a first!) and an actual premeditated label. Neither of which I took pictures of, but hey, those are the boring parts. Depth of field! I'm so arty! 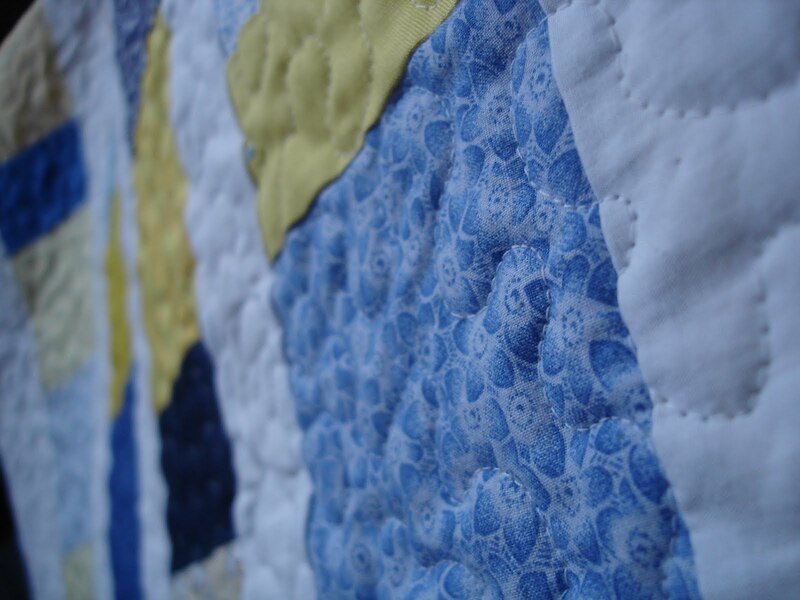 This quilt also sports a couple tiny patches of some of the cotton I hand-dyed at a workshop several years ago. The binding is a blue and yellow floral that has been in my stash for years. 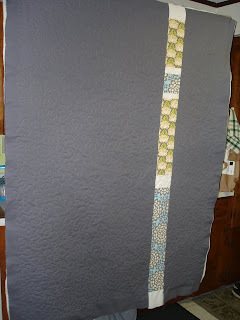 The backing is a purplish-blue floral that doesn't match the front by any stretch of the imagination. I've had it for a long time and bought it as a remnant for making hanging sleeves and backings out of. I'm almost out of it, so it may soon be on to the red chicken fabric I got at the same time but have never really used. Hrm. It's about 40" across (??) and, uh, less than that tall. (I didn't measure.) Making this top was really really easy, compared to ones that involve pinwheels or stars or triangles of any kind. Note to self. I don't know about you, but I often find that there's a sour spot somewhere in the middle of all the projects I do where I get really down on it. I see all the seams that are off, the colors are garish, the iron left a bad stain on one block, this is fugly and I could not possibly display it in public. 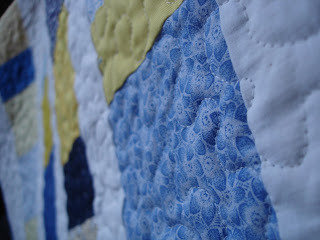 That's about where I am now with the Sun and Sky quilt. I soaked the squares in very hot water, then dried them - mostly let them air-dry, but I also hit them with a hair dryer at the beginning in order to speed up the process. 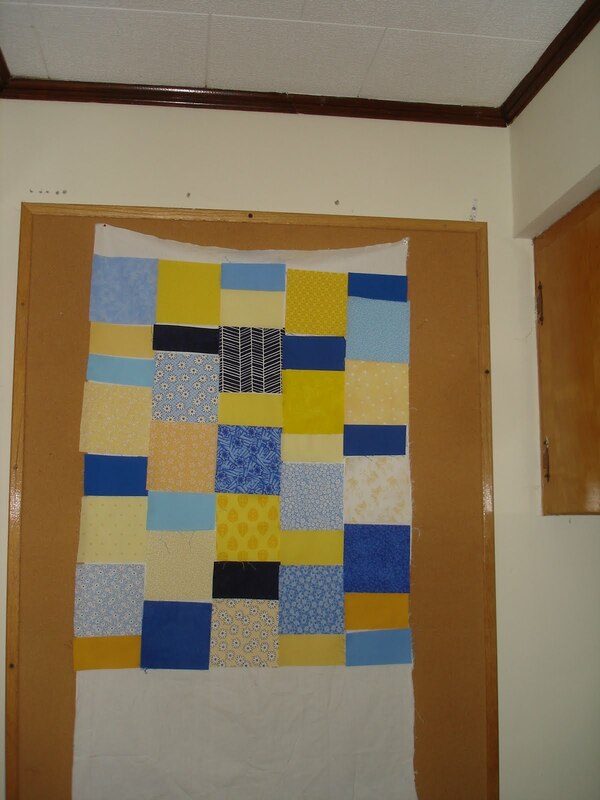 This did result in the loss of some yardage, but better now than once they were sewn into a quilt with a bunch of prewashed fabrics. 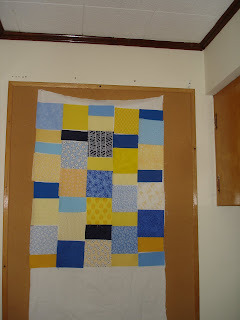 Then there was lots of arranging and rearranging and adding in more squares from my stash. I'll spare you all the pictures of that. 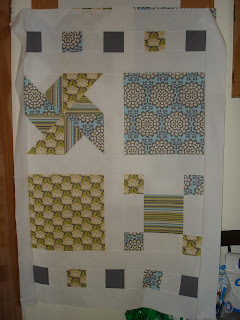 At first my plan for this one was to cut all the charms in half, sew each half to an equal-sized white rectangle, and then do something cool with all of those squares, a la Crazy Mom Quilts. 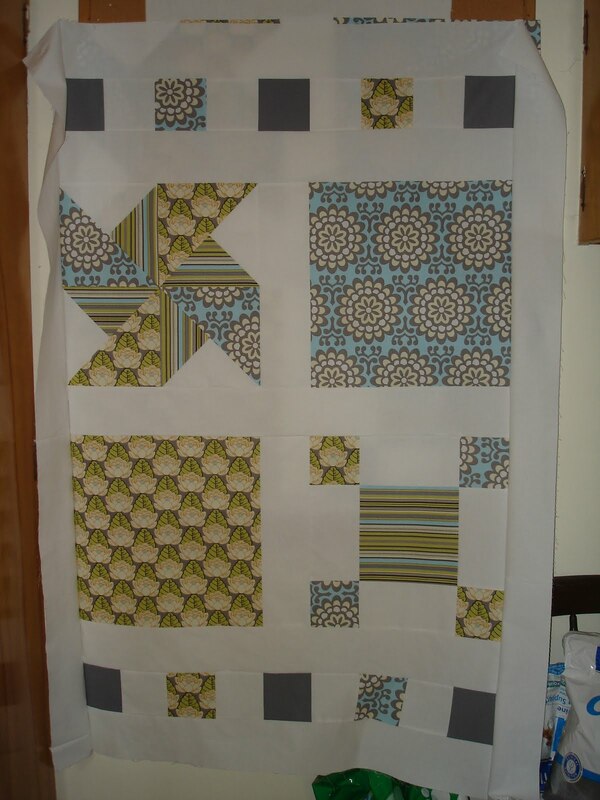 But once I started doing the math, I realized that the squares would be very small after squaring the charms, cutting them in half, cutting them down to squares again, then taking a 1/4" seam allowance. So I decided to go with a popular charm pattern (at least according to google image search) that involved making long strips of charms/half-charms and alternating the strips with white. Bleh! Let's try that again. A bit better, but maybe we should add in what will be the white space, and make the columns a little longer. Now we're basted and ready to quilt. And I'm feeling like it's almost too fugly to go on. But of course I will. Sometimes it turns out okay, and even if it doesn't, I'm glad to have the chance to see how my machine does with free-motion now that it's been serviced. Around June, I was talking with my mom and asked her what she'd like for Christmas. She said, "A finished vest!" At that point I wasn't aware of having started a vest, so my curiosity was piqued. 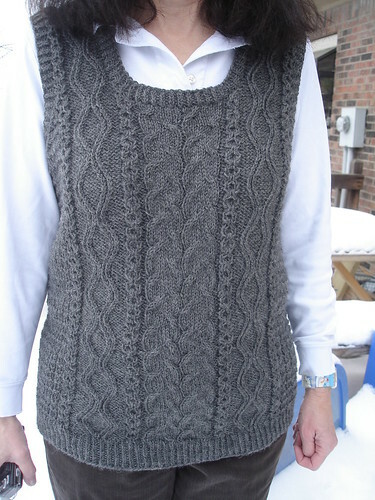 Further investigation revealed that I needed to start a vest, and also finish it. And it should be cute, and have cables. When we found ourselves in a yarn store, as tends to happen, we picked out some Colrain (a nice and shiny aran weight merino/tencel from WEBS) in periwinkle and a bit of dark blue for the edges. 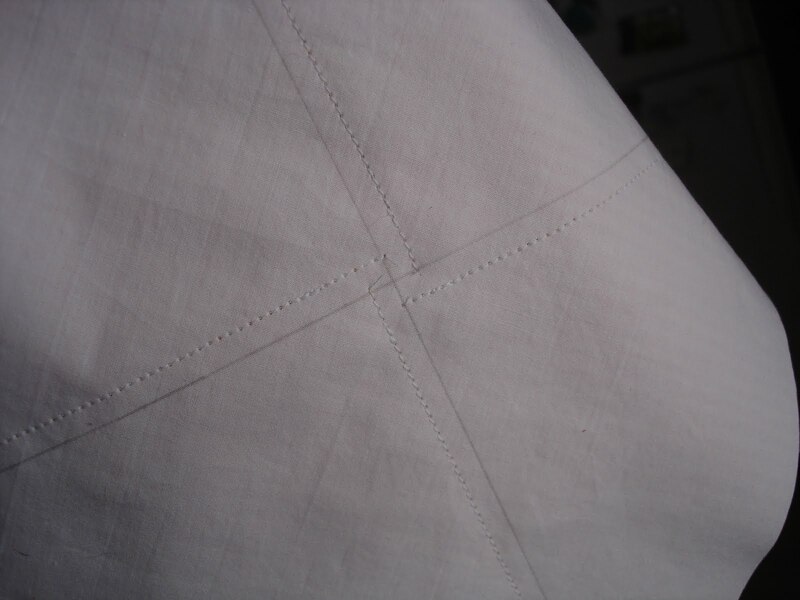 We checked out bazillions of patterns, and I considered just making one up myself, but ended up being glad I didn't. 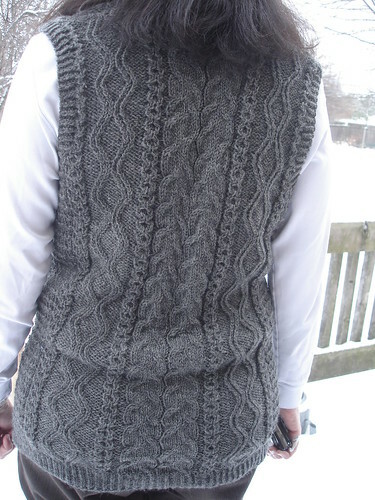 I'm a big believer in surprises, so having gathered all kinds of data about what was desirable in a vest and what was not, I went off on my own to make the final choice for the pattern. Wood Hollow won, because its main cable was identical to one Mom had liked in a different pattern but it called for the right weight of yarn and looked like something I could finish in the relatively limited amount of time I had. I don't normally swatch, but I also don't normally make non-sock garments where exact size is important. So I sucked it up and made a swatch, grappling with the ever-present problem of swatching flat for something that will be in the round. 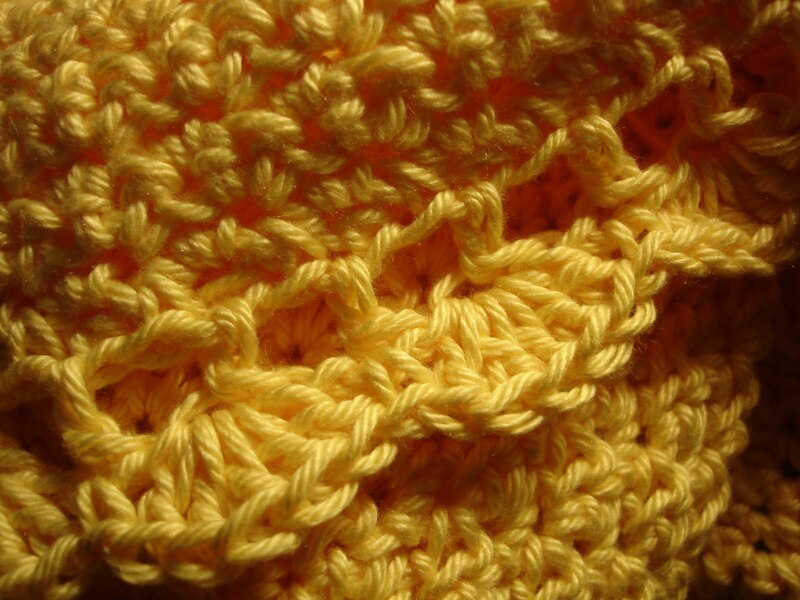 (Oh yeah - I was modifying it to knit in the round.) And it's a really, really, really good thing I swatched, because that yarn + that pattern, even using numbers from the smallest size, would have been huge. 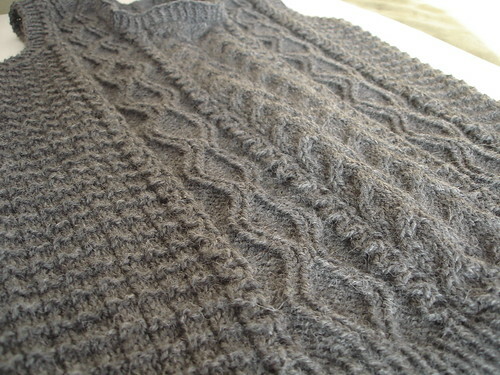 The pattern calls for Cascade 220, a light worsted, and Colrain was an aran. Fair enough. I got out some leftover Cascade 220 and swatched again, and my results were much the same. I swatched on smaller needles, which barely made a difference. 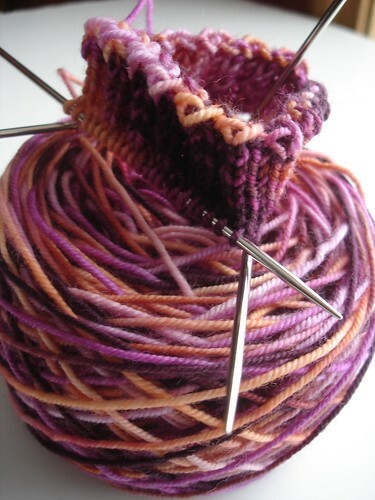 At this point I went back to the drawing board and searched around for a pattern that would work well with the Colrain, but didn't come up with anything I liked as much as Wood Hollow, so I started looking for a yarn that was nearby in terms of yarn stores, and that knit up around 6.5 spi. If I could've found a straight merino, I would have gone with that, but the Berocco knit up very nicely and should be pretty warm. It's 50% merino, 50% alpaca. I made it a bit longer than called for because Mom likes sweaters that way. Probably should have added a bit of waist shaping, but I didn't even think about it until I was seaming the tops. Someday I'll make another of these for myself. Had to pay close attention to the pattern, but it moved pretty quickly overall. Precisely how bad is it to mix un-pre-washed and pre-washed fabrics in a quilt project? Will it ruin it totally, can't-even-give-this-to-the-dogs ruin it? Or will it cause people to merely have a profound spiritual experience upon gazing at it, rather than actually moving them to tears? 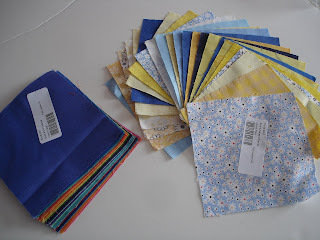 I ask because in Connecting Threads's Cyber Monday sale, I got two charm packs for 87 cents each, and I would love to start making them into quilts right this second, but have no un-pre-washed white fabric. That situation will be remedied just as soon as the mail starts moving again, thanks to a lovely gift certificate from my aunt. Washing the charms by hand is an option, but probably a terrible one, more trouble than it's worth. Hrm, I'm also realizing that the stash fabric I want to add to these quilts has all been washed already. Perhaps I'll just seize the day, then. Or maybe I could just soak the charms in really hot water, then line dry them over a register. 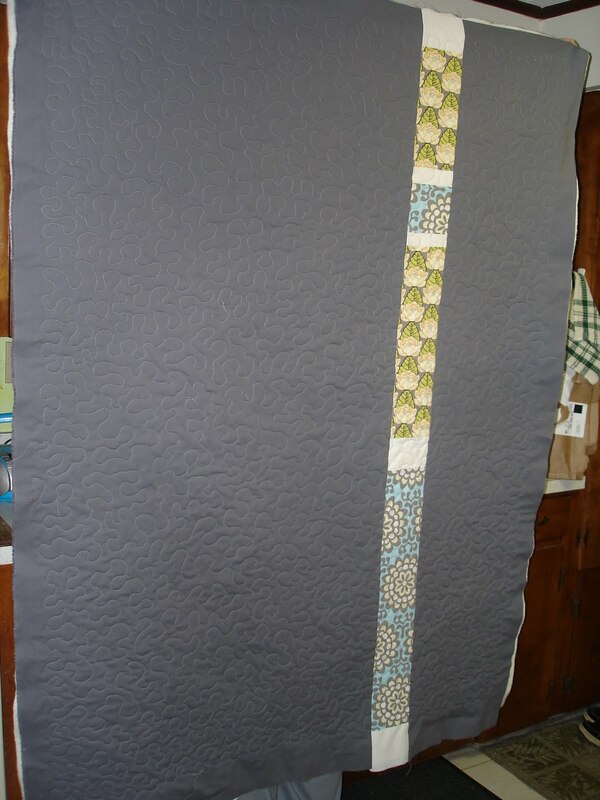 That would probably move my starting time back to tomorrow, but then I could work on the things I really should be working on today, AND look forward to starting that quilt sooner rather than later. Yeah, that's the ticket.